While the BlackBerry Torch 9800 is the most popular touchscreen devices with 48.7% marketshare, the BlackBerry Bold 9900/9930 is clearly catching up as the most popular of the BlackBerry 7 devices. Also it looks as if I was right in regards to the production of the 9380 and 9790 being a waste of RIM’s time, and unneeded fragmentation. 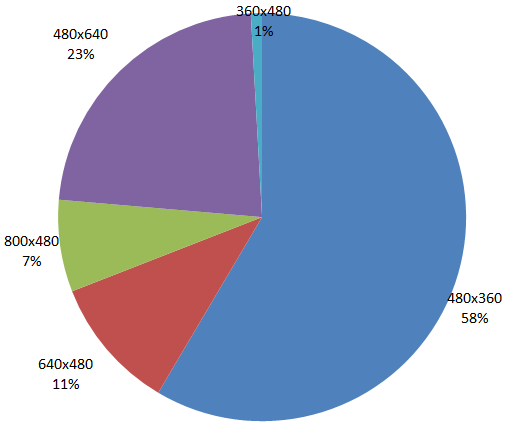 Looking at the distribution of screen resolution on BlackBerry touchscreens shows why supporting the 9790 is not a priority for any developers. 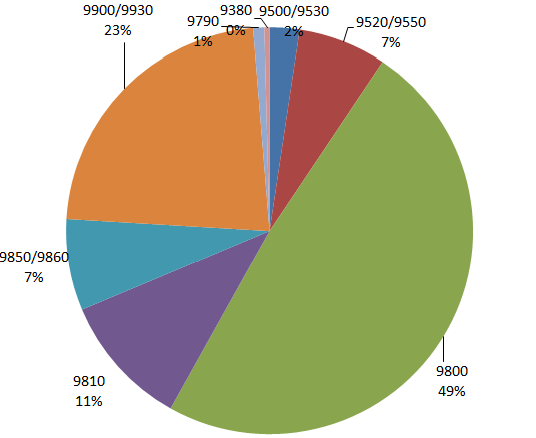 Accounting for just 0.88% of all touchscreen devices it is far to unique with no reason to purchases it instead of the Bold 9900. The Curve 9380 however can easily be supported due to its many similarities with the Torch 9800 and Storm series. In fact its 480×360 screen resolution is present in over half of all touchscreen BlackBerrys in the wild. These stats are based on December downloads of the free strategy game Pixelated.